Fort Fido Dog Daycare & Boarding News Blog: Mischevious Max! We rounded out our week with one last awesome "newbie." 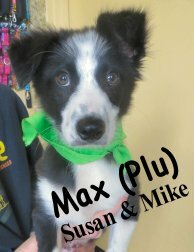 Little Max is a Border Collie-mix, and stole our hearts right away with his smashing good looks. Curious and smart, he had a good time checking out the other dogs in the medium roll. He was a little trepidatious of the bigger guys, but did well with the pups closer to his own size-- the ever-playful Rudy kept him company, as did our boarding buddy Frances. Max is joining the Fort at a great time for socialization. The puppy months are especially important for exposing your dog to new people, places, pups, and experiences. Having such a wide range of experience under his belt should help this little guy to grow up balanced and confident. We look forward to watching him grow and learn! Two speeds: stop and go go go! Our friends are at it again! You're the man Riley, article, & Happy One Year! Another New Member Of The Pack! A Peek at all Pooches! Welcome to the pack, Ginger! Gettin comfy at the Fort, and Jack takes a romp! Doing Double Duty-- Two great new pups!